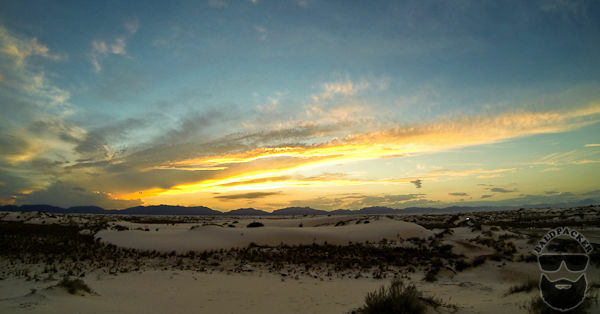 White Sands National Monument is the world’s largest gypsum dunefield making it a unique and beautiful natural wonder. 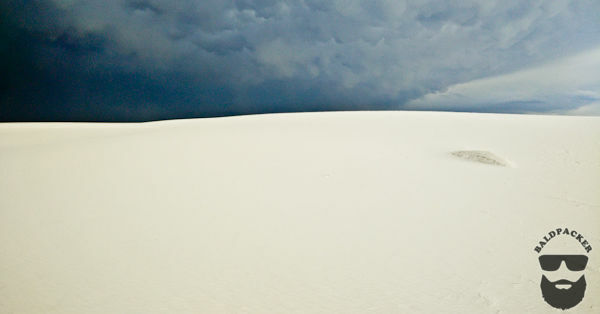 Although I had never heard about White Sands before my girlfriend moved to Odessa, Texas, once I saw photos of the area I knew we had to plan a visit. We began our journey from West Texas with a stop in Roswell, New Mexico and then stops at Three Rivers Petroglyph Site and Pistachioland before finally arriving at White Sands around 4pm. 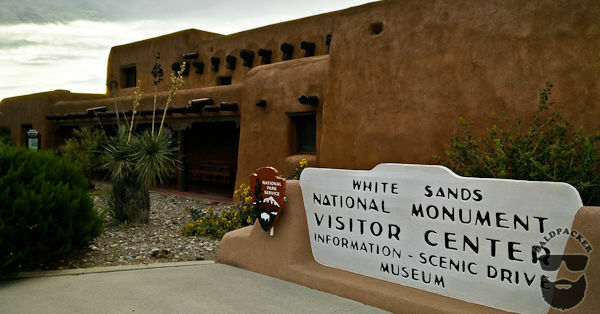 Interestingly, the area next to White Sands National Monument is a secure military facility used for missile testing and sometimes Highway 70 and Dunes Drive in the park close to traffic. Luckily, there were no scheduled missile tests when we drove to White Sands but it’s worth checking the schedule in advance to ensure you will not face any road closures. 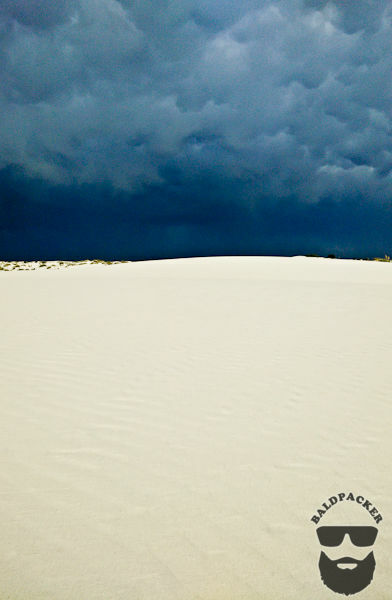 Our plan was to backcountry camp at one of the ten primitive backcountry camping sites in White Sands National Monument, but after being slammed by marble sized hail in Three Rivers we began to rethink our plan. We became even more concerned when the radio station we were listening to was interrupted by an emergency broadcast advising that a storm with 70mph winds and golf ball sized hail was making its way from Las Cruces towards Albuquerque and that people should seek shelter away from windows. 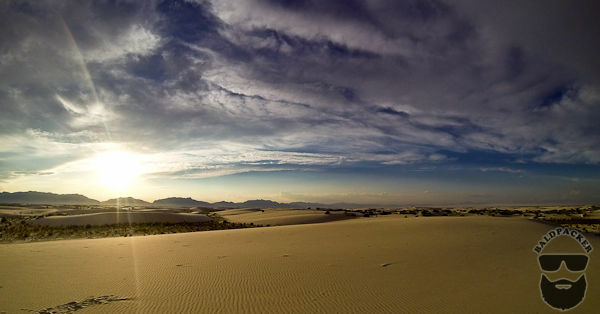 Although we were visiting White Sands in October, supposedly after monsoon season, when we arrived at the visitor center the sky to the south was spewing nothing but trouble. After a little discussion with the helpful National Park Service staff, who showed us a satellite image of the weather pattern, which appeared to cover all of southeastern New Mexico, Sara and I decided it was probably not wise to set-up a metal poled tent in the middle of a desert during what looked to be a huge thunderstorm. 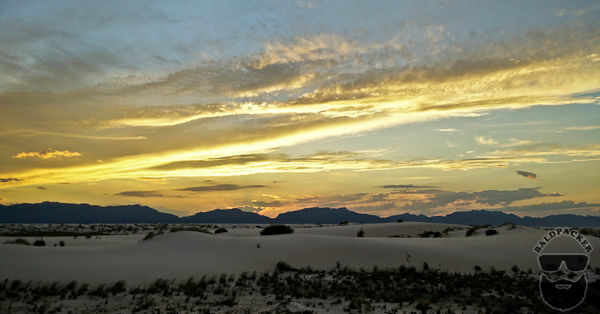 Even though we decided not to camp at White Sands on this visit, it was good to learn that the ten primitive backcountry camping sites are only available on a first-come-first-served basis; they do not take advance reservations in case there is a closure of the park due to missile testing on the adjacent missile range. Its also good to know that permits are only available until one hour before sunset, to ensure you have time to walk the 1.1 miles (1.8 kilometers) into the backcountry camping spots. 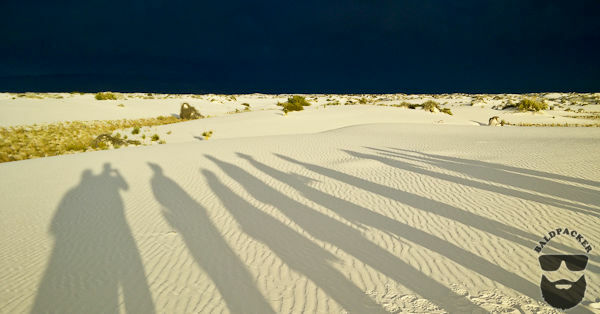 Even though we were unable to enjoy sunset and sunrise in White Sands as we had planned, we still went into the park to see the White Sands dunes and take part in a free guided sunset tour put on by the National Park Service. 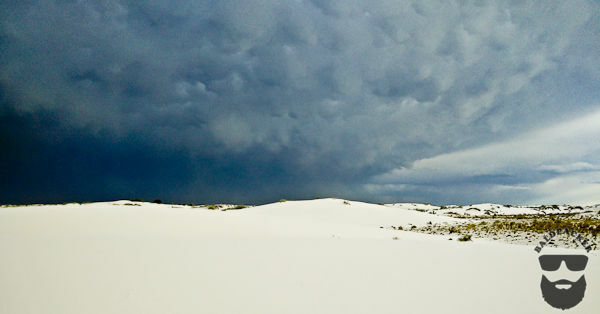 Given the weather in the Tularosa Basin is usually clear, with sunny skies approximately 330 days out of the year, in some ways we were lucky to see the dark foreboding skies contrast with the white gypsum sand dunes. An hour before sunset we met for the free sunset tour. The NPS staff was just as concerned about the weather as we were so we did not venture far into the sand dunes, but we still learned a lot about how the dunes at White Sands formed and how vegetation manages to survive in a place where the ground constantly moves out from under the plants. 250 million years ago, the south eastern New Mexico and West Texas were under a shallow sea that was filled with gypsum deposits. The gypsum deposits turned into stone, which were then uplifted to form a giant dome when the Rocky Mountains were formed 70 million years ago. Around 10 million years ago, the dome began to collapse which crated the Tularosa Basin, with the sides of the dome formation remaining as the San Andres and Sacramento mountain ranges. 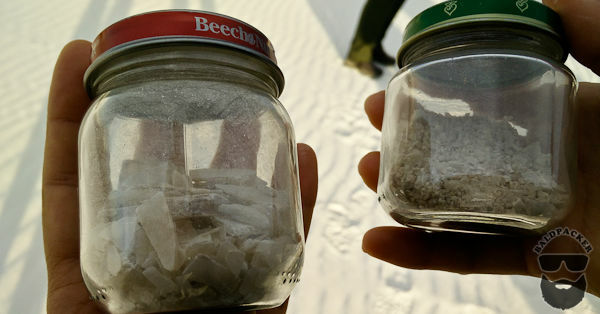 One of the reasons White Sands is so unique is that gypsum is rarely found in the form of sand because it is soluble in water. 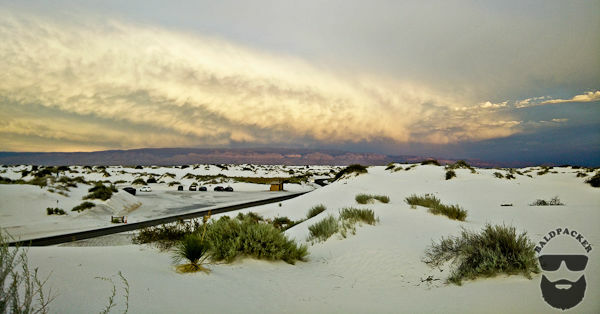 The solubility of gypsum is what helped the White Sands deposit grow so large though, as rain and snow that falls in the surrounding mountains dissolve gypsum from the rocks and carry it into the Tularosa Basin. Since no rivers drain the Tularosa Basin, the water (along with the gypsum and other sediments it contains) are trapped within the basin and once the water evaporates the solid gypsum rocks and sands remain. 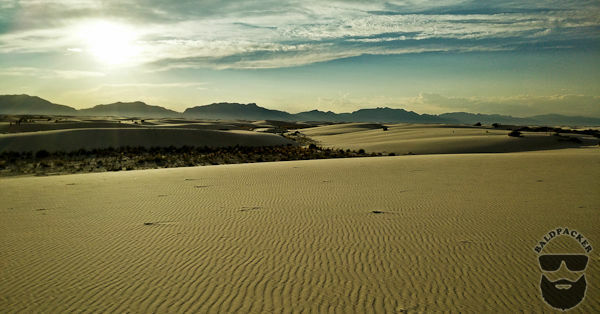 The larger gypsum rocks and pebbles are eroded by winds and weather until it gets reduced in size to fine grained sand which dusts the surface of the White Sands area. One of the nice things about White Sands is that only the top couple of inches of the dunes are sand, with solidified gypsum underneath, making it easy to walk around. 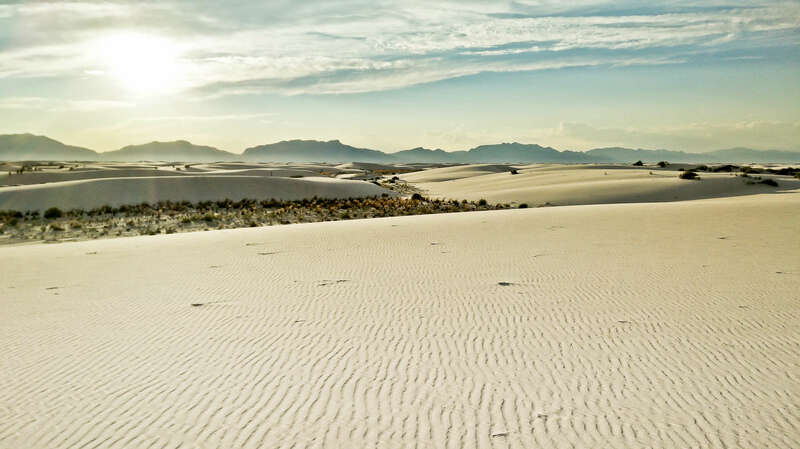 Visitors at White Sands are generally free to wander the 275 square miles of white sand desert, but there are numerous trails that I would recommend following since the sand dunes are constantly moving and changing and it is very easy to become disoriented and lost. Although the southern skies remained dark, Sara and I found a tall sand dune to sit on top of where we could enjoy the sunset to the much clearer west. Watching the colours and textures of the dunes constantly change as the sun set was really enjoyable and I was disappointed we would not be able to enjoy a similar show for sunrise in the morning. After the sun passed below the mountain range to the west, Sara and I left the park to drive to Lincoln National Forest to camp for the night. Although we knew it would likely also rain and possibly hail in Lincoln National Forest, we hoped we would be more sheltered from lightning in the forest than we would be in White Sands. 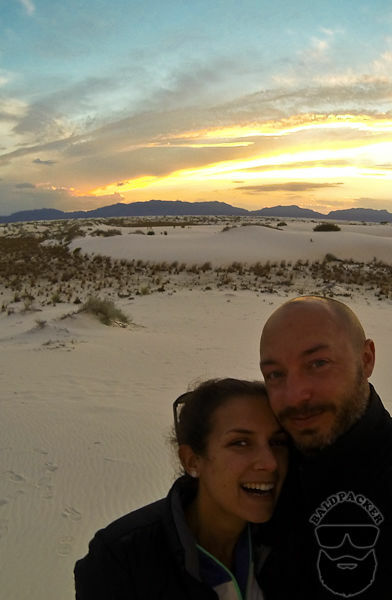 Given how much we enjoyed our short visit to White Sands, I am sure we will return to White Sands National Monument again in the Spring to make our backcountry camping plan happen. I look forward to the day I can wake up and enjoy my morning while watching the sun rise over such spectacular scenery.